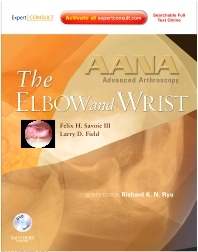 AANA Advanced Arthroscopy: The Wrist and Elbow, by Felix H. Savoie, III, MD and Larry D. Field, MD, helps you make the most effective use of advanced and emerging, state-of-the-art arthroscopic techniques for managing a wide range of wrist and elbow problems. Premier arthroscopic surgeons discuss disease-specific options, managing and avoiding complications, and rehabilitation protocols…in print and online. 15 videos demonstrate arthroscopic RH resection for post-traumatic arthritis, arthroscopic management of ulnotriquetral abutment, arthroscopy and the management of MC and phalangeal fractures, two-portal CTR: the Chow technique, elbow PLICA arthroscopic débridement, and more. Access the fully searchable text, along with a video library of procedures and links to PubMed online at expertconsult.com. Stay current through coverage of hot topics like Osteocapsular Arthroplasty of the Elbow; Elbow Fractures; Arthroscopic Excision of Dorsal Ganglion; Midcarpal Instability: Arthroscopic Techniques; Acute Scaphoid Fractures in Nonunions; Carpal, Metacarpal, and Phalangeal Fractures; and Endoscopic Carpal Tunnel Release: Chow Technique. Hone your skills thanks to 15 videos of techniques—on Arthroscopic RH Resection for Post-Traumatic Arthritis, Arthroscopic Management of Ulnotriquetral Abutment, Arthroscopy and the Management of MC and Phalangeal Fractures, Two-Portal CTR: The Chow Technique, Elbow PLICA Arthroscopic Débridement, and more—performed by experts.